This is your last shot at tickets to see "Hamilton" at ASU Gammage. In December, officials announced that the Broadway show would hold a lottery for orchestra level seats at $10 each -- a steal considering prices on the resale market have topped $200 for balcony-level seats and $500 to sit in the orchestra. Forty tickets will be available through the lottery for each performance. Download the official "Hamilton" app through your phone's app store or register at http://hamiltonmusical.com/lottery/ . 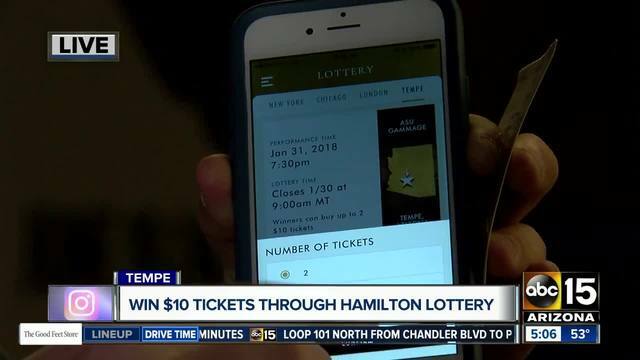 When the lottery opens (Jan. 28), you will see an option to register for the "Tempe" lottery. Since the show is still in San Diego, you will see "San Diego" listed in the app right now. The lottery will open at 11 a.m. two days prior to the performance date and close at 9 a.m. the day before the show. Winners (and non-winners) will be notified at 11 a.m. the day before each show through text message (if provided) and email. Those selected for the lottery will be able to purchase up to two orchestra-level tickets at $10 each. "Hamilton" will be at ASU Gammage, Jan. 30 - Feb. 25, 2018. The first lottery will open on Jan. 28 at 11 a.m., according to a news release. You must be at least 18 years old to enter the lottery. Those selected to purchase tickets through the lottery have to purchase tickets by 4 p.m. the day before the show. You will receive a purchase link and code via email. Tickets not bought by 4 p.m. will be forfeited. Tickets will be at will-call three hours prior to the show. Tickets cannot be resold; they will be voided. The lottery is limited to one entry per person. Multiple entries and entries using "disposable" email addresses will be thrown out. The Tony award-winning musical has been a big ticket-seller for ASU Gammage. In May, season tickets sold-out in mere hours, the first time in the theater's history that had happened. Individual tickets went on sale in December through Ticketmaster's Verified Fan Program and were claimed quickly. If you are planning beyond Hamilton, other shows set to visit ASU Gammage this season include The King and I, The Color Purple, Les Miserables, The Humans and School of Rock.